Given that a dog, Laika, was the 1st astronaut to orbit the earth, it’s appropriate for a dog to travel through the wormhole. After travelling through the wormhole, the 2001 story (book version, as is the “it’s full of stars” quote which is not in the movie) concludes. What’s new in this blog? DataFrames (giant Spreadsheets), ML Pipelines and Scala! As of Spark 2.0, the RDD-based APIs in the spark.mllib package has entered maintenance mode. 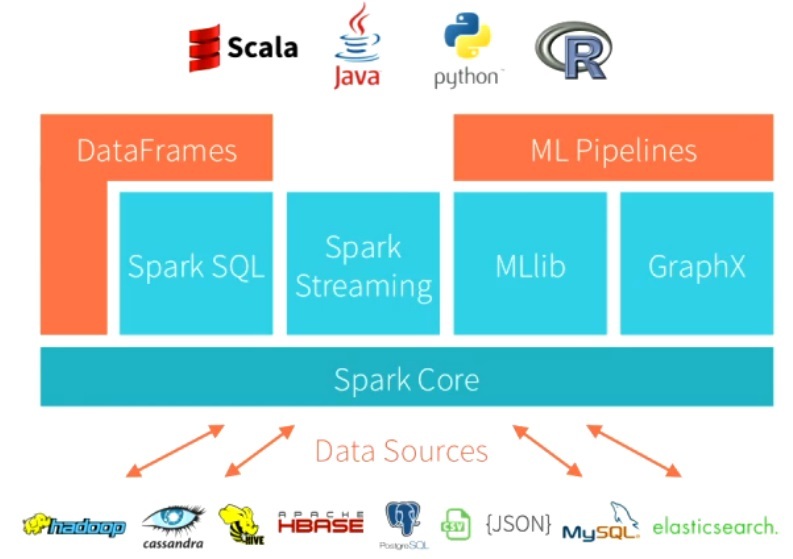 The primary Machine Learning API for Spark is now the DataFrame-based API in the spark.ml package. Last blog we explored Decision Tree Machine Learning based on RDDs, using a sample of the Instametrics monitoring data, to try and predict long JVM Garbage Collections. Now we’ll update the code to DataFrames and use all the available real monitoring data (a snapshot from the Instaclustr pre-production clusters). What are DataFrames? Big, distributed, scalable spreadsheets! They are immutable and can be transformed with a DSL, pre-defined functions, and user-defined functions. Why did I ditch Java (at least temporarily)? Have I become “transcendent” after watching 2001 too many times? Not exactly. Because Instaclustr provides a fully managed cluster option which includes Cassandra, Spark and Zeppelin (a Spark Scala web-based notebook) it was easier to quickly deploy, run and debug Scala code than Java. You just type Scala code into Zeppelin in a browser, run it and look at the output (and repeat). There’s no need to set up a separate client instance in AWS. Trying to learn both Scala and Spark at the same time was “fun”. Scala is syntactically similar to Java (just throw away the semi-colons as Scala is line-oriented, and you don’t need variable type declarations as types are inferred, but statically typed), so the example should still make sense even without any Scala experience (like me). Let’s revisit the Decision Tree ML code in Scala + DataFrames. Here’s the latest documentation for the Decision Tree Classifier for DataFrames. As the Instametrics monitoring data we have is in Cassandra we need to read the data into Spark from Cassandra first. To do this we use the spark cassandra connector. Instaclustr provides a Spark Cassandra assembly Jar. In Zeppelin, the spark context will already be defined for you, and there are helper functions to simplify reading in a Cassandra table. For some reason, the 1st argument to cassandraFormat is the table name, and the 2nd is the keyspace. This returns (lazily) a DataFrame object. Where did this data come from? From some complex pre-processing (next blog). The label column was also previously computed and saved (the label is the class to be learned, in this case either 1.0 for positive examples, or 0.0 for negative examples). The next trick is to replace null values with something else (e.g. 0), as we run into problems with nulls later on (even though in theory the MLLib algorithms cope with sparse vectors). Next we need to create a single column of features. VectorAssembler is a transformer that combines a list of columns into a single vector column, which is what we want. However, it turns out to have problems with null values (which is why we replaced them above). However, as pointed out the previous blog the model accuracy isn’t a particularly useful metric depending on the actual ratio of positive/negative examples. We can use the MulticlassMetrics to compute the confusion matrix, precision, and recall. And then also compute the actual rate of negative examples for comparison with the model accuracy metric. MulticlassMetrics has an auxiliary constructor for DataFrames but I still had to convert to an RDD before use. See this book for more information and ways of creating a confusion matrix from a DataFrame directly. And now print the model out. The decision tree actually doesn’t make much “sense” as the named features have been replaced by feature numbers (e.g. If (feature 23 <= 8720.749999999996) Predict 0.0 Else etc). Ideally there should be some way of automatically converting them back to the original names. These metrics were combined with thresholds to ensure that about 5% of the examples were positive (i.e. had “long” read/write times). And these metrics were removed from the data before use to prevent cheating by the machine learning algorithm. The wide data table read from Cassandra had 1518 examples (rows), which was split into training and test data. The training data set had 1067 examples, but only 60 positive examples (not a huge number for a Big Data problem, and in practice the number of examples needs to be >> the number of features, at least 2x). There were 2839 features (columns). Learning only took a few minutes. Model accuracy was 0.96, however, as the negative example rate was 0.95 this isn’t much better than guessing. Precision was 0.60 and Recall was 0.66. Thanks to Instaclustr people for help (with Instametrics data, support for Cassandra, Spark and Zeppelin, and machine learning discussions) including Christophe, Jordan, Alwyn, Alex_I, Juan, Joe & Jen. How did we get here? Next blog we’ll look behind the scenes at the code that was used to preprocess the raw metrics from Cassandra, clean the data, convert it into the wide table format, and correctly label the examples. And, how to run Spark Scala code in Zeppelin!